S.P. Sailaja or Sripathi Panditaradhyula Sailaja, is a versatile Indian singer. She lent her voice to Telugu, Tamil and Kannada films. She has sung about 5000 songs to date. She was born in Konetammapeta in the Nellore district of Andhra Pradesh . 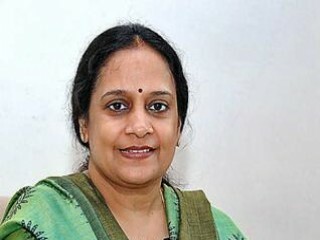 Her father SP Sambamurthy was a well-known exponent of Harikatha and her brother SP Balasubramanyam is a prolific singer in Telugu, Tamil, Hindi, Kannada, Malayalam and many other languages. She is married to actor Subhalekha Sudhakar.The couple have a son, Sreekar. She has also given voice for various artists like Tabu, Sonali Bendre, Sridevi etc. She acted in Sagara Sangamam, a Telugu film directed by K. Viswanath in which she played the role of a Classical dancer which was dubbed in Tamil as "Salangai Oli". Besides a Playback singer, she is also a Classical Dancer.